BACKGROUND: Clinical course and complication rate following laparoscopy-assisted distal gastrectomy (LADG) are influenced by clinical technical expertise and experience because reconstruction is performed through a small mini laparotomy window. This study was designed to compare postoperative complications of Billroth-I and Roux-en Y reconstructions following LADG for gastric cancer. PATIENTS AND METHODS: Between October 1997 and April 2009, 80 consecutive patients underwent LADG. These patients were classified into two groups: Billroth-I group (n = 49) and Roux-en Y group (n = 31), and the patient and tumor characteristics, surgical details, and postoperative complications were analyzed. 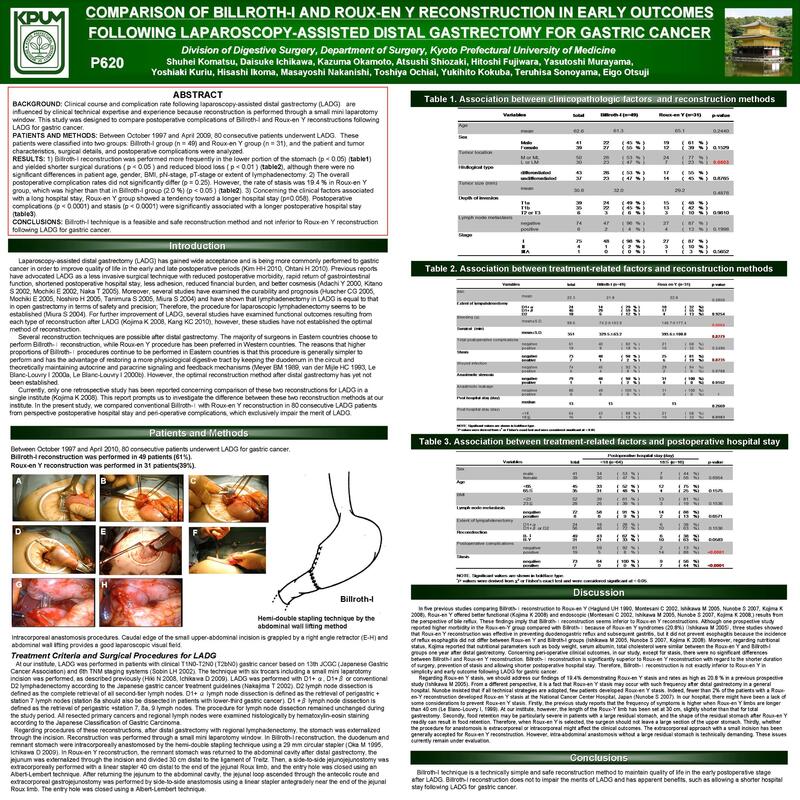 RESULTS: 1) Billroth-I reconstruction was performed more frequently in the lower portion of the stomach (p < 0.05) and yielded shorter surgical durations ( p < 0.05 ) and reduced blood loss ( p < 0.01 ), although there were no significant differences in patient age, gender, BMI, pN-stage, pT-stage or extent of lymphadenectomy. 2) The overall postoperative complication rates did not significantly differ ( p = 0.25 ). However, the rate of stasis was 19.4 % in Roux-en Y group, which was higher than that in Billroth-I group (2.0 %) ( p < 0.05 ). 3) Concerning the clinical factors associated with a long hospital stay, Roux-en Y group showed a tendency toward a longer hospital stay ( p=0.058 ). Postoperative complications ( p < 0.0001 ) and stasis ( p < 0.0001) were significantly associated with a longer postoperative hospital stay. CONCLUSIONS: Billroth-I technique is a feasible and safe reconstruction method and not inferior to Roux-en Y reconstruction following LADG for gastric cancer.